Is quality elusive in online education? Anya Kamenetz, NPR’s lead education blogger, wrote an interesting story lamenting the frequently futile search for “quality” in online education. She reported that last year more than 7 million students, slightly over one-third of all U.S. college students, took at least one course online for credit. As a traditional brick and mortar teacher who has eyed online teaching with great interest, I can’t help but be disappointed in the results of virtual instruction. See my previous posts here and here. Most online courses contain brief video lectures, readings, self-correcting multiple-choice quizzes, and discussion board forums. Basically, educational publishers have copied the traditional classroom read-lecture-write-discuss format in the online realm. Audrey Watters questions whether we should frame teaching and learning in the language we use to talk about the Web and media. Can high quality education be reduced to mere content delivery? Will effective teaching ever be as easy as putting resources online? Kamenetz suggests we need to define and measure “quality” in online education. Admittedly this will be difficult, as four hundred years of education research has not yet yielded any consensus on a definition for quality in face-to-face education. Adaptive learning shows promise in online education, especially in the area of reaching remedial students. A central feature of adaptive learning is that it varies the presentation of content according to the user’s responses. If you get questions wrong, the machine adjusts and gives you easier questions and if you get questions right, the machine starts giving you harder questions. This is hard for a teacher to do in front of a live audience of 35-40 students, but a computer can do it easily. I suspect that the survivors in online education will be the institutions that have a deep stable of dynamic teachers capable of forging positive relationships with their students and facile enough with computers to personalize engaging lessons with adaptive technology. Younger and at-risk students may benefit from gamification strategies, however, middle class, college-ready students may not need these bells and whistles. Deep down, they already know that education is a lot like life – you get out what you put in. And as it turns out, delayed gratification is a lesson that is extremely difficult to teach online. 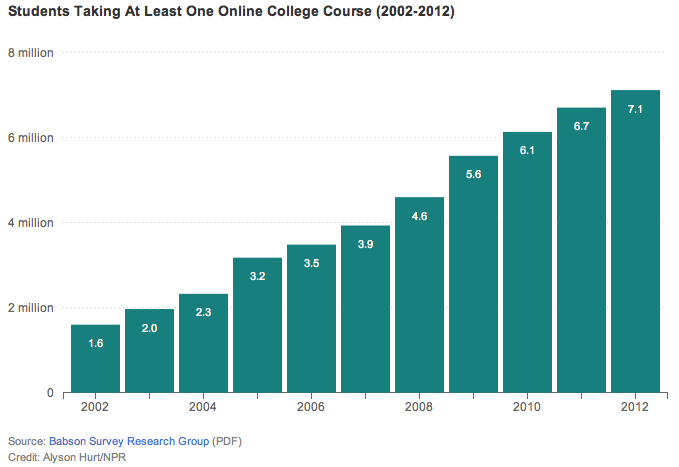 Will Online Learning Help Students? My recent posts about UC Scout helping low-income students increase access to A-G and AP courses caused me to reflect about an experience while I was principal of a small high school (350 students). A vocal and generally supportive group of parents wanted a math teacher to oversee a small class (11 students) of AP Calculus. Unfortunately, 143 students (approximately 40% of the school) had failed Algebra 1. Thus, I had the choice of do I devote a teacher to instructing a small group of gifted students, or do I devote a teacher to help the students who still need to pass Algebra? Several parents threatened to move their child from the school if the teacher was not provided to the AP Calculus class. As a compromise, we agreed to have the students take AP Calculus online. The math teacher agreed to work with the students during her conference period. Another teacher who was working toward Calculus certification agreed to host the students in his classroom and go through the Apex curriculum with them. Unfortunately, this solution did not work for the students, who found the independent work to be above their abilities. None of the students were able to score a 3 on the AP test, and receive credit. I now realize that these results were consistent with this report on UC Scout, which indicated no matter how advanced the computer explanations are of A-G or AP course work, the vast majority of students will not succeed unless they have a caring teacher, who is an expert in the subject to troubleshoot, advise, intervene, offer multiple explanations, coach, cajole, and coax them through the course. Another teacher recently contacted me via Twitter. She will be co-teaching a virtual course for the first time this fall. Since her grasp of the subject matter is not at the expert level, she was concerned that she might not be able to help students succeed in a hybrid online/in-person class. My answer was to build a relationship with the students first, then focus on student needs to define what you want to accomplish as a teacher. Should your students read more, write more, collaborate more, or create more? Technology is merely a learning tool to help achieve that goal. Develop metrics that help monitor student progress. For students who need to read more, supplement the online readings with in class Socratic circles. For students who need to write more, set up goal-setting strategies like word production, or the number of claims and counter claims in a piece of writing. For students who need to collaborate more, set up a series of team-building, problem-solving tasks centered on the course subject matter. Lastly, for students who need to create more, arrange showings of their work and invite a real audience to judge it via an online polling tool. Students engage more when they know an audience will view their work. The audience can be peers, teachers, administrators, parents, or members of the community. As districts experiment with blended learning staffing models in traditional brick and mortar schools, I suspect we will see the educational version of supply side economics revealed again and again. Students who have the support at home and the drive to persist will not experience difficulty in online classes; however, the students without this support and without this grit will not be helped by online courses. Teachers who are capable of building positive and productive relationships with students will become crucial in a blended learning environment. UCSD researchers have classified the types of in-person supports that teachers provided to students enrolled in online UC Scout courses. These seven roles are: (a) Humans as fixers/explainers of technology; (b) Humans as digesters of content; (c) Humans as explainers of content; (d) Humans as extenders of content, toward application; (e) Human as providers of feedback and assessment; (f) Humans as regulators of the learning experience; and (g) Human peers as supporters of the learning experience. Examples from each category are explained in great detail in the report. I offer a summary below. Personally, I should note that I objected to the phrase “humans as” that the researchers used as a prefix to the classifications in the report. I understand they were interested in examining the human role in virtual learning, but the language usage of “human supports” was off-putting to me and caused me to stop reading the report several times. Perhaps “in-person supports” would be less distracting. Humans as fixers/explainers of technology involves helping students overcome tech glitches, broken links, freezing videos or animations. These tasks most likely do not require the presence of a highly qualified, subject matter expert and could be done by a paraprofessional. Humans as digesters of content is when teachers cherry pick online material from the course that may be particularly important to upcoming assessments or activities. This could encompass creating study guides that help the students navigate through the large body of course readings and independent practice modules. Most likely, a subject matter expert is required for this task. Humans as explainers of content. The UC Scout courses explain key concepts mainly via online text sections, then sometimes they supplement these explanations with videos, and/or animations. Many students required in-person support to clarify components that were not fully comprehensible to them. Again, a subject matter expert is most likely required for this complex task. Humans as extenders of content, toward application describes class and individual discussions of course concepts. UC Scout leaves this to the instructor’s discretion. Some teachers heavily supplement online material with face-to-face discussions, which students credit with helping them apply the concepts rather than simply defining them correctly on assessments. This also included hands-on labs for science courses, where teachers provided in-person support for “doing science.” It is unclear whether this role could be fulfilled by an experienced TA, or if it requires a subject matter expert. Human as providers of feedback and assessment asks a teacher to monitor student progress, provide 1-1 help and small group instruction on fundamentals that students do not understand from the online curriculum. This role requires an in-person teacher to use the data from the course, but also develop relationships with students in order to greater assist them. This role is especially crucial for students who are repeating a class and may require more monitoring and coaching from a TA or teacher in class than other students who are making good progress in UC Scout’s self-paced instructional program. Again, it is unclear whether this role could be fulfilled by an experienced TA, or a subject matter expert, who can verify student comprehension, adjust assessments based on student progress, and offer highly individualized motivational support. Humans as regulators of the learning experience can also mean regulators of student behavior. TAs expressed frustration with students who did not want to be enrolled in the class and did not try to complete the course work. This function may not be essential if online courses screen for student motivation and do not allow these students to enroll in online classes. In theory in-person regulation of the learning experience should be unnecessary as computers should monitor and support individual pacing. In this study, however, there was considerable variation in the courses over the amount of in person regulation was required to keep low-income students on task. It remains to be seen how essential this role will be as online education matures. Human peers as supporters of the learning experience is a role that was revealed by student surveys. When allowed to work together, students regularly relied on peers for support before and after turning to the adult instructors. Therefore, peer support may be provided by fellow students, course TAs, family members and not require a highly qualified teacher. I have found this overlooked report to be very helpful in helping me understand the pros and cons of UC Scout. The goal of the premade, UC-vetted courses may have been to increase access to AP and A-G courses for low-income students, but the results may be another opportunity for the educational rich to get richer. Students who are experienced in digital education, motivated, and have educational support structures already in place will have an advantage over low-income students. I wonder what unintended consequences will result from this well-intentioned program?